One of the disadvantages of being a trailblazer is that people tend to focus on the trail and overlook the blaze. When Spike Lee emerged in the mid-’80s, there were virtually no African-American film directors of note (not that we’re exactly deluged with them today), so the media instantly appointed him as the spokesman for Black Cinema. That wasn’t entirely inaccurate—if you name your production company 40 Acres And A Mule Filmworks, after the U.S. government’s broken promise to former slaves, you’re obviously making a deliberate, pointed statement. But the emphasis on Spike Lee, cultural pioneer and sociopolitical gadfly, couldn’t help but obscure most people’s view of Spike Lee, radical stylist and aesthetic visionary. Few American filmmakers have been so relentlessly innovative, yet Lee rarely gets named alongside the likes of Martin Scorsese, David Lynch, or Terrence Malick when the conversation turns to purely visual mastery. He’s admired and respected, but an element of sheer awe seems to be missing. That’s especially true in the case of his 1989 masterpiece, Do The Right Thing. Though it seems kind of incredible from today’s perspective, all of the buzz surrounding the film at the time of its release involved the question of whether it might provoke riots and racial violence; articles about it were just as likely to appear on the editorial page as in the arts section. The movie was analyzed nearly to death, but hardly anybody mentioned how genuinely bizarre it was, how little it resembled almost anything else in theaters back then—or today, for that matter. Lee took a scenario that seems to cry out for gritty handheld realism and directed it with the aggressive abstraction of a Broadway musical, and he stuck with that approach even at the film’s explosive climax. 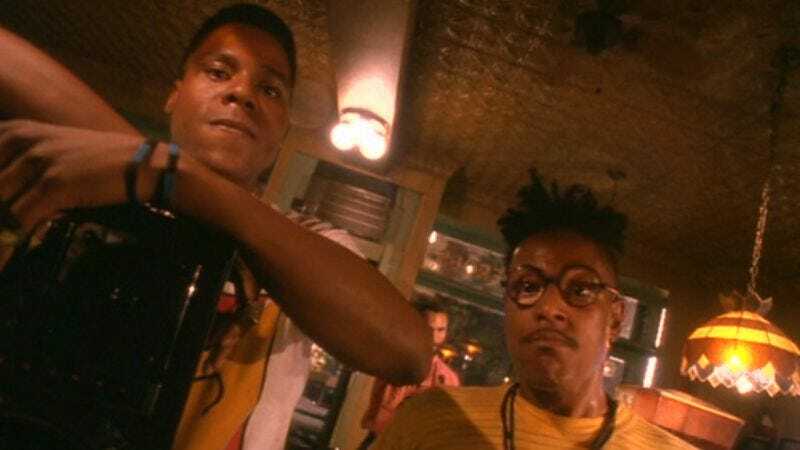 Take a look at the final showdown between Radio Raheem (Bill Nunn), Buggin Out (Giancarlo Esposito), and Sal (Danny Aiello), ostensibly over the issue of whether there should be pictures of black folks on the wall of Sal’s Famous Pizzeria. If you had described this confrontation to me before I saw it, or had even shown me the shooting script, I would never remotely have imagined something so boldly heightened. You’ve already got a bunch of pissed-off, literally overheated macho dudes yelling obscenities and racial slurs, which seems like drama a-plenty. And we’re talking here about an incident that was inspired by several real-life hate crimes, most notably a 1986 attack in Howard Beach, Queens (which gets explicitly name-checked shortly after this clip ends). Something very serious, in other words. Most directors’ natural inclination would be to shoot it as simply as possible and let the turbocharged vitriol speak for itself. Lee chooses instead to double down, creating a visual correlative to the full-volume blast of Radio Raheem’s boom box. (Somebody should create an updated version of the movie in which Radio Raheem walks around holding an iPod, ignored by everybody he encounters.) Toward the end, it actually feels as if the film itself is shouting. As with all great filmmaking, the glory of this sequence resides not merely in the overall conception—“let’s cant everything to suggest instability”— but in the precision of each individual composition (credit to ace cinematographer Ernest Dickerson) and the dynamic way one shot bounces off another (via Lee’s longtime editor, Barry Alexander Brown). How that works can be tough to articulate, even though that’s my job in this column. For example, in the series of stunned reaction shots after Sal destroys Raheem’s radio, I find it incredibly powerful that Lee retains the overhead setup of the booth where the four kids sat, even though the three boys got up and only the girl remains, cowering in one corner. But I’m not sure why. It’s got nothing to do with her—she’s completely unimportant. It’s about space, somehow. As if the conflict had carved Sal Pizzeria’s into discrete units, each with its own integrity, and now we’re surveying not the people specifically—the three boys are seen only in the background—but those fragmentary units. I know that sounds pretentious, but it’s the best rational explanation I have for what’s essentially an unconscious emotional effect. Cutting to a close-up of the girl, thereby acknowledging that the composition of the room has changed, would have ruined it. In any case, I find it hilarious that people once watched this scene (and the scene with the police that follows) and were consumed with wondering whether audiences would leave the theater and immediately start tossing garbage cans through plate-glass windows. That controversy seems quaint today, but Do The Right Thing’s vividly expressive filmmaking hasn’t aged one iota. With any luck, we may one day have enough distance from Spike Lee’s instrumental role in creating an African-American film movement to recognize that his artistry transcends race. He’s made great movies, passable movies, terrible movies, but he’s always in there swinging.